The Medela Freestyle, Medela’s newest model, will amaze many moms. If you are used to lugging a backpack-sized breast pump around, this small pump is a welcome change. It fits in the palm of your hand and weighs less than 1 pound! Children are often excited when they master new skills without using their hands. Now, mothers can be just as proud of themselves when they learn to pump hands-free. The Freestyle pump from Medela comes with a special kit that allows mothers to pump while doing other things with their hands. It doesn’t even make a mess! A good breast pump should be able to go wherever you go. If you need to return to work, your pump should go with you. If you want to enjoy a relaxing lunch with friends, you should be able to express milk in the restroom if needed. The Medela Freestyle comes with a rechargeable battery and a convenient tote to carry everything along with you. The tote is very discreet, so everyone doesn’t have to know what you are up to as you head to a private spot. Double pumps can be a bit heavier than single pumps, but Medela made this one incredibly lightweight. The pump weighs just one pound and the accessories are lightweight as well. The heaviest thing in the tote will be the battery. Babies have a special way of drawing milk from their mother’s breast. They first stimulate the breast so that the milk drops and more can be expressed. They then start a more aggressive sucking pattern that is designed to draw out the milk. After doing some research, Medela created a technology that allows their pumps to mimic this natural sucking pattern of babies. The pump first stimulates the breast to let down the milk, and then changes patterns to express the milk. You can adjust the speed and intensity of suction on this machine. This ensures every mother finds a setting that is comfortable for her breasts. 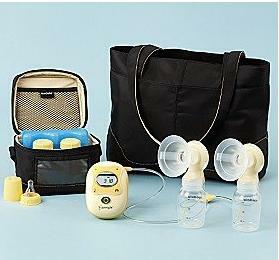 Intuitive breast pumps are the hottest things on the market today. A pump with an easy-to-read backlit digital display that recorded your pumping session would have been unimaginable ten years ago, but it is available now on this Medela breast pump. The digital display reports your pumping time and records the settings of your session. This makes it easy to push a button and go back to those settings on your next pumping session. Pumping away from home can be difficult if you don’t have a discrete way to keep your expressed milk cool until you get back home. The Freestyle tote has a built-in cooler that holds four bottles, which come with your purchase of the product. It also has an ice pack, which ensures the milk stays cool for up to twelve hours. You no longer have to put your expressed milk in the company refrigerator! All parts of the pump that come in contact with your skin or your baby’s milk are completely BPA free. This includes the four bottles that come with the pump. The Medela Freestyle sells for less than $400. You may be able to get it below $350 if you shop around online. Remember, shipping on this item is always free at Amazon! The motor carries a limited one year warranty. Other parts are covered by a limited ninety day warranty. 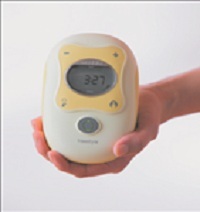 The Medela Freestyle breast pump has received over 150 consumer reviews on Amazon.com. Those reviewers have given the pump an average of 4 stars out of 5. There are many, many happy new mothers nursing away with the Medela Freestyle breast pump. Unfortunately, there are also some mothers who report a weak motor that doesn’t live up to the standards expected from a Medela pump. The pump works perfectly fine for most users, but some units may die out within a few months of use. The good news is that Medela honors the warranty on this product and is very fast to send replacement parts. These parts restore the unit to proper functioning, so pumping can continue. The risk is that no mother knows if they might get the defective unit that doesn’t last very long and needs these replacement parts. Otherwise, there are no complaints against the Medela Freestyle pump. Consumers love that it is so easy to use and gentle on the breast. Where Can You Buy The Medela Freestyle Breast Pump? 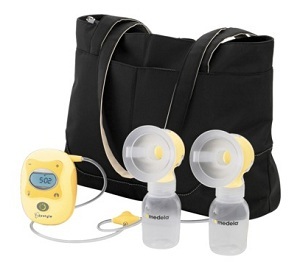 While we have found the quite of few retailers carry Medela breast pumps, Amazon.com tends to have the lowest prices and free shipping on this model. Click here to check current prices at Amazon.com. There are currently over 100 different reviews on Amazon moms who have all used this breast pump. Click here to read their reviews for yourself.